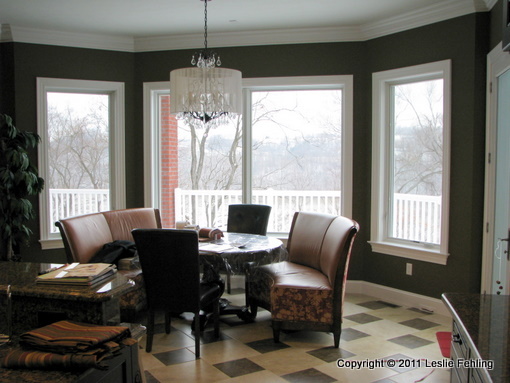 My client's home featured a gorgeous kitchen with wide windows offering spectacular lake views. My job as a window treatment designer was to add some softness, color, and warmth to a room that was filled primarily with hard surfaces. Of course, preserving the view was of great importance, also. Using my computer design program, I came up with several renderings of design options for the windows in the breakfast area, including a variety of valances. But the client and I both agreed that the best design for this space would be drapery panels framing the windows. We decided to have some fun with the panels, though, and do something special, something that would really look "custom." I designed these custom drapery panels with an attached valance, a contrasting cuff top, and a skirt at the bottom, accented with banding. The two parson's chairs were slipcovered in striped fabric, and have gathered skirts and ties. The stools at the island bar were given slipcovered cushions, which add comfort and style to the simple wooden stools. The cushion tops were quilted to add interest. The gathered skirts match those on the Parson's chairs. When I make skirted stool cushion covers, I attach ties underneath, so the cushions can be tied securely to the stool, and they won't shift around during use. On the inside bottom of the cushion, there is a zipper opening, so the slipcover can be easily removed for cleaning. They stay put when they're supposed to, and come off when they need to! The drapery panels were hung from 3-1/2" metal holdbacks. The contrasting red cuffs were edged with 1/8" red welt cord. 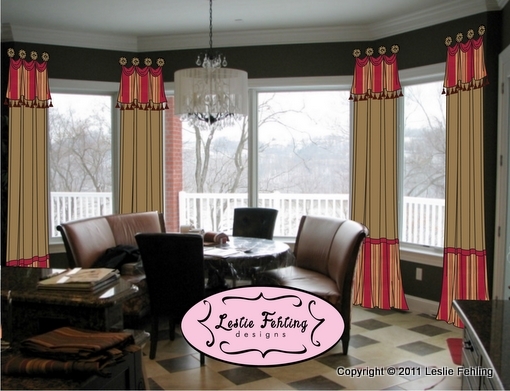 The attached valances were trimmed with a pretty tassel fringe. The 24" striped skirts were accented with a band of red sateen along the top edge. We kept the center section of the panels light, using a solid tan brushed cotton. 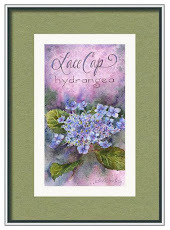 This helped to keep distractions at eye level to a minimum, so the water views would continue to take center stage. My client is very happy with the way her new window treatments and slipcovers have enhanced the beauty and functionality of her kitchen and breakfast area. Sounds used to echo in the space, but the new soft furnishings have made things feel cozier and warmer. The cotton fabrics help keep things casual, but there's no denying that the unique style of the draperies sets them apart from the ordinary. 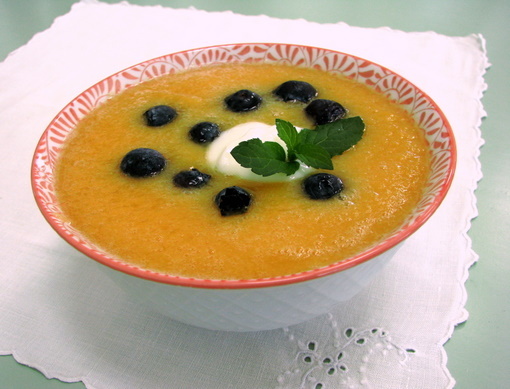 I really enjoy making this soup in the summer when cantaloupes are in season. It's a nice change from eating cantaloupe in chunks or wedges, and the combination of ingredients is so yummy! I usually have it for breakfast, but, when there's a batch of it in the fridge, I can't leave it alone, and I'll eat it for lunch and snacks, too, until it's gone! Cool and refreshing, with a hint of ginger, it's just the thing for a summer day. - Puree all the ingredients in a blender. - A large cantaloupe usually makes about a recipe and a half. 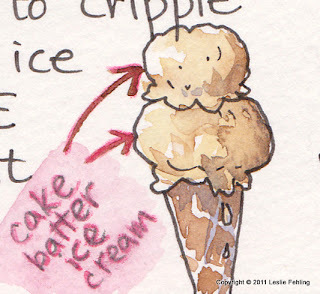 - Plain yogurt may be substituted for the half of the buttermilk. 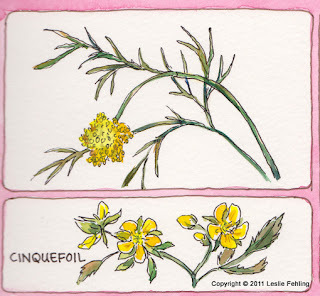 - Splenda may be used instead of sugar, 1-2 packets/recipe. The final page of this vacation sketchbook is probably my favorite. It brings back memories of one perfect day filled with glorious scenery, sunshine, laughter, and fun. 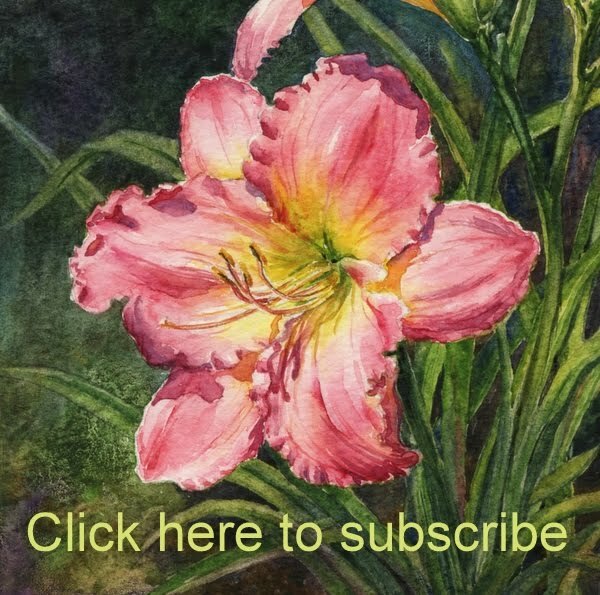 I love, love, love this painting! The colors, the subject matter, the light and shadows. 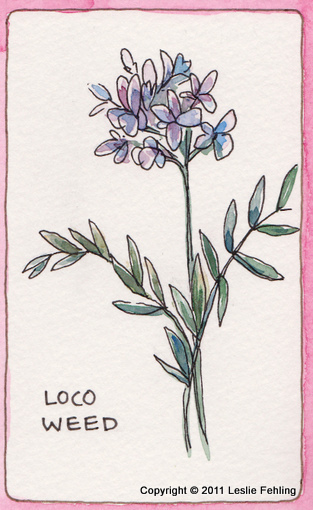 It says "Colorado" to me: aspen and pine trees, mountains, boulders, blue sky, a grassy meadow, and even a touch of wildflowers. 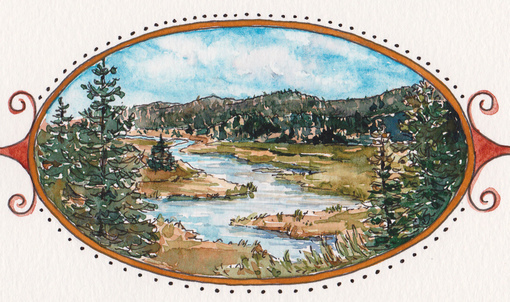 And one of the best moments of the whole week was captured in my sketch of the South Platte River. Late afternoon, sitting on the banks of the river with my sketchbook on my lap, while my mother and sister chatted and watched Karli tossing stones in the water - these are the moments to remember from a vacation. That's why I make the time to stop, look, and paint. One of the highlights of our week in Colorado was the day we spent hiking at Mueller State Park. There were wildflowers everywhere! I sketched just a sampling of what we saw. 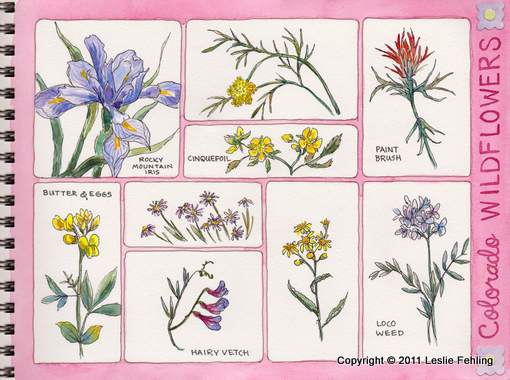 Even though there were 5 or 6 wildflower books at the house where we were staying, and I searched through every one of them, I wasn't able to identify all of the plants that I drew. 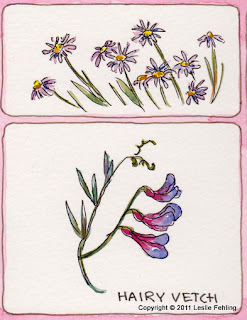 If you know the names of the three mystery flowers shown in my sketch, let me know. I found Rocky Mountain iris growing along the banks of the South Platte River. 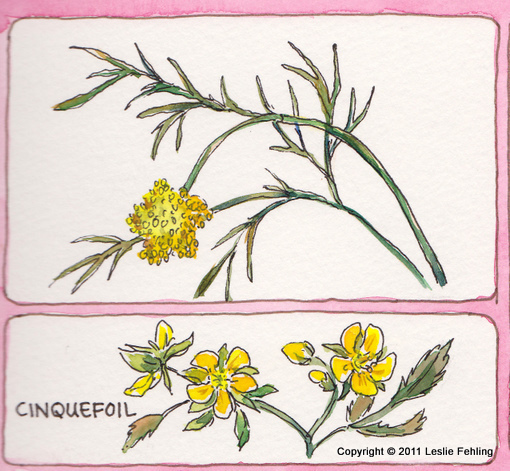 They're so beautiful that it's hard to believe they're wild plants. Isn't the name of this next one cute? 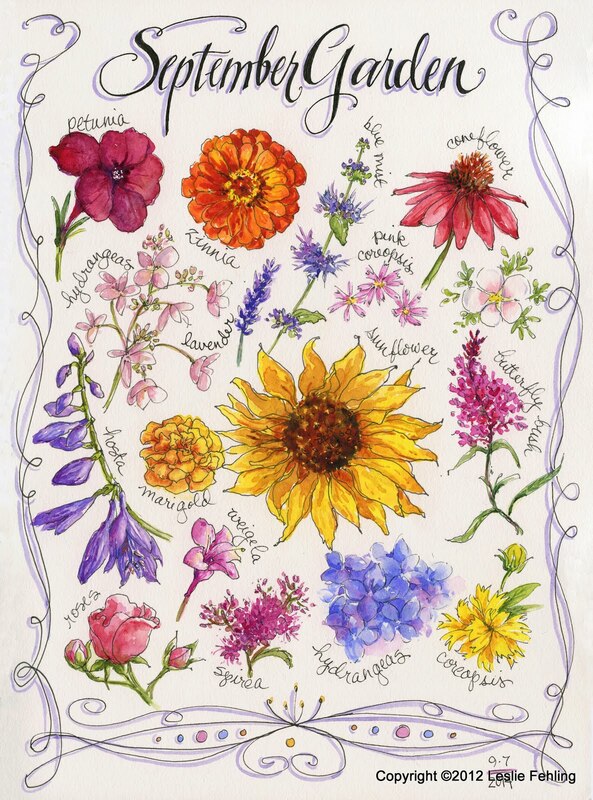 Driving by in a car, you wouldn't even notice most of these flowers. You have to be out there walking through the woods or the fields, and make a point of looking for them. Then, it's like a wonderful little surprise when you see them! I think June must be the prettiest month of the year in the Rockies. I'm so glad I had a chance to enjoy it. 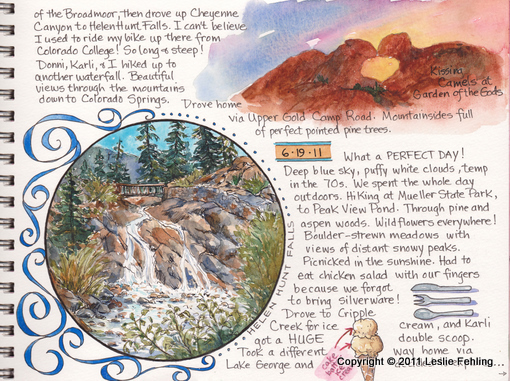 The final day of my "Sketchbook Journeys - Colorado" series is coming up tomorrow, and I'm looking forward to sharing with you my two favorite sketches from my week in the mountains. 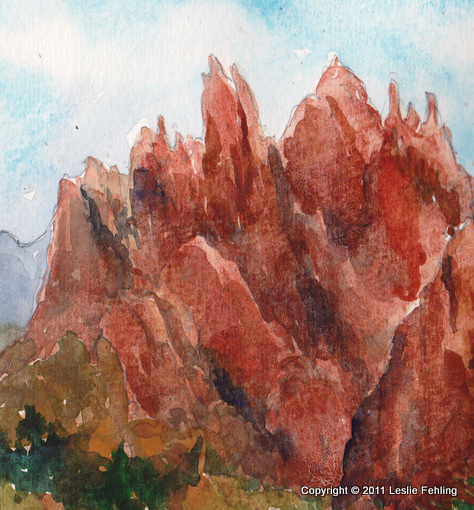 This page features another sketch from our visit to Garden of the Gods, near Manitou Springs, Colorado. An afternoon thunderstorm had blown through, leaving a spectacular sunset in its wake. 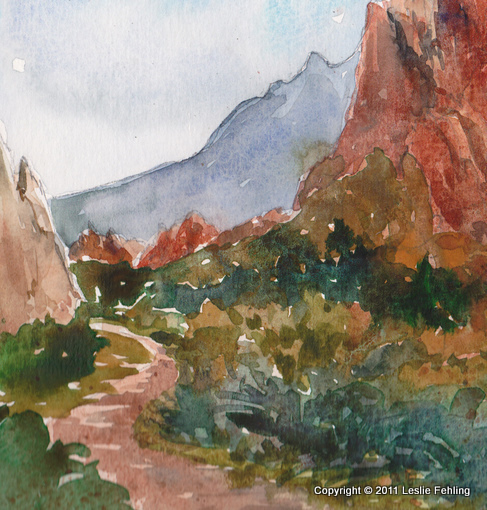 I captured it in my sketch, with the "Kissing Camels" rock formation in the foreground. 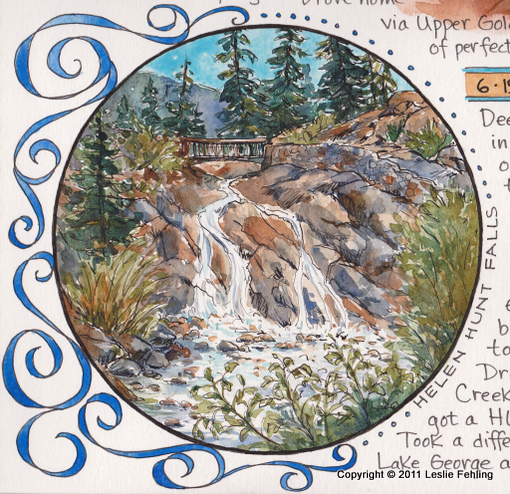 One of my favorite destinations for bike riding during my years at Colorado College was Helen Hunt Falls. It's located way up a long, windy road, at the end of North Cheyenne Canyon, and the return trip, downhill all the way, made all the work getting up there worthwhile. It hasn't changed in all these years - it's still a nice place to visit on a hot summer day. 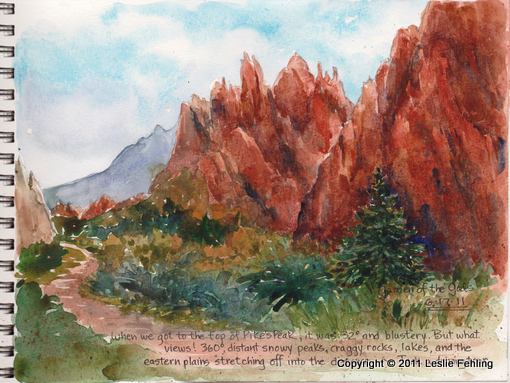 I really enjoyed painting this sketch of Garden of the Gods. It's such a spectacular place, and no painting could ever do it justice, but this page reminds me of how I felt, being there in that awesome place. This page is a little different than the others. I didn't use my ink pen for the drawing. I did a quick sketch using a 4B pencil, then painted it later back at the house. Painting a mass of green foliage is always a challenge. 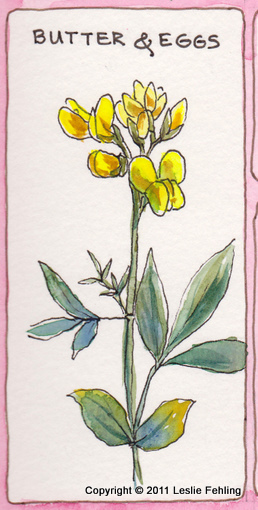 I try to vary the greens, and add yellow, red, blue, and brown for interest. 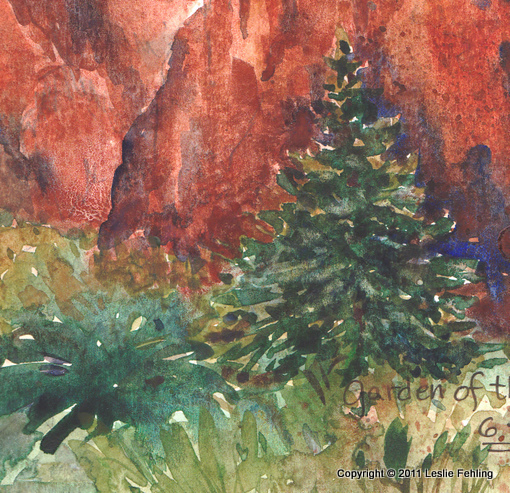 Coming tomorrow: more Garden of the Gods, plus a waterfall! 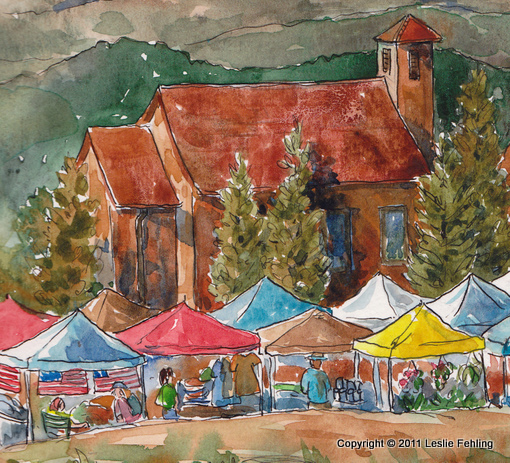 The farmer's market in Woodland Park is fantastic! Held every Friday morning during the summer, there must have been over 50 vendors set up the day we were there, selling everything from silk skirts to tamales. (I bought a skirt and skipped the tamales.) Everyone was so friendly! It was one of the highlights of our trip. 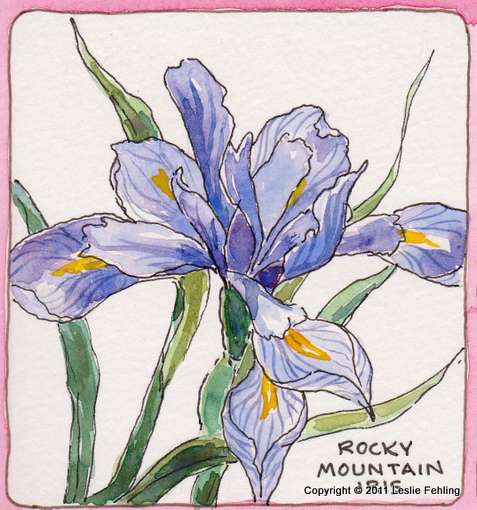 I went out early that morning to sketch - it was a gorgeous sunny day, and Pike's Peak looked so amazing against the deep blue sky. 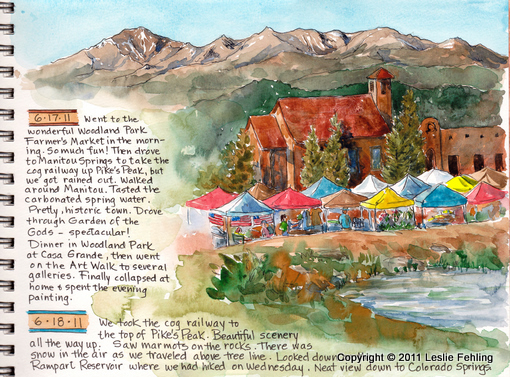 I sat in the park by a pond to paint the market. I just can't resist painting awnings and canopies! Aren't they fun? Woodland Park, where we stayed during our vacation, is a funky little town with some nice historical buildings on the main street. It's up in the mountains west of Colorado Springs, and there are beautiful views in every direction. It was a good base camp from which to see the area. 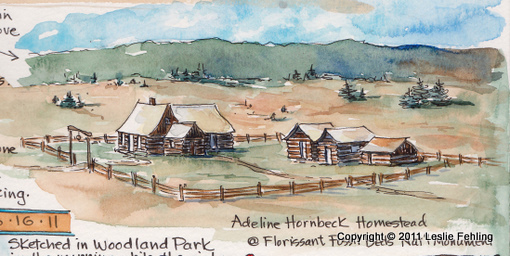 We visited an old homestead where a feisty pioneer woman, Adeline Hornbeck, raised four children and managed a successful ranch back in the 1800s. It was so cool reading about her. She was amazing! 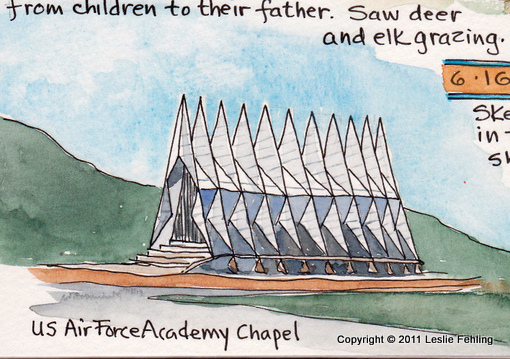 We took a side trip to the US Air Force Academy and almost got blown away by some ferocious winds coming down off the mountains! 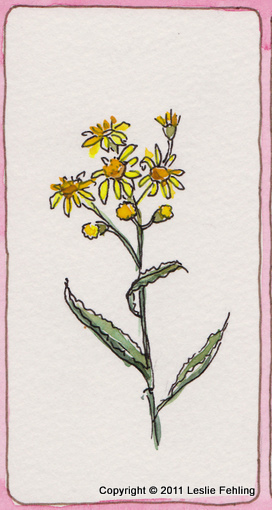 Stop by again tomorrow for more sketches! 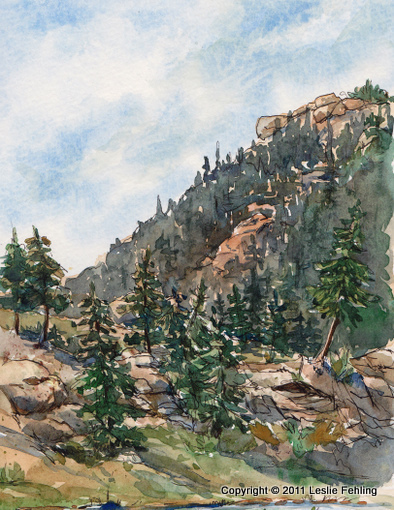 As promised, here are the watercolor sketches I did while on vacation with my family in Colorado. We had such a great time, and my mom, sister, and niece were so generous in allowing me time to sketch when we were out and about. 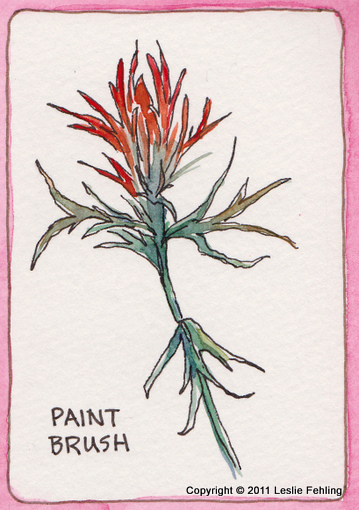 Without their encouragement, I wouldn't have been able to spend as much time painting as I did. 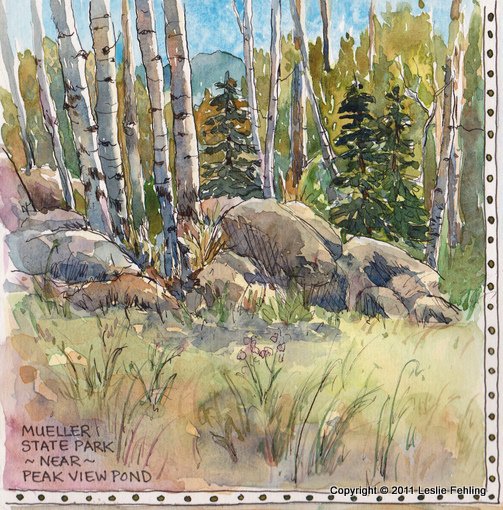 Here's page 1 of my Colorado journal. 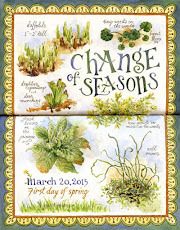 I always like to do a title page to introduce each section of my travel sketchbook. This time it has a rainbow border filled with some of the things that were special about our trip, plus an elliptical framed landscape. 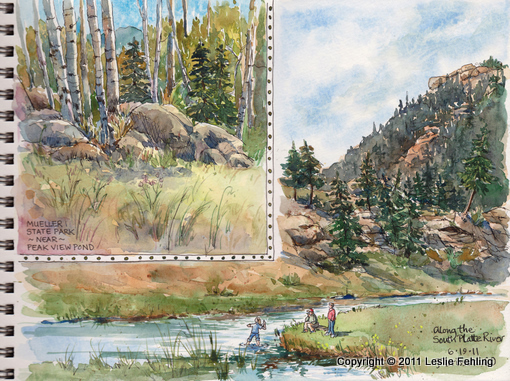 The landscape painting shows one of the prettiest places we visited, Eleven Mile Canyon, along the South Platte River, near Lake George, Colorado. 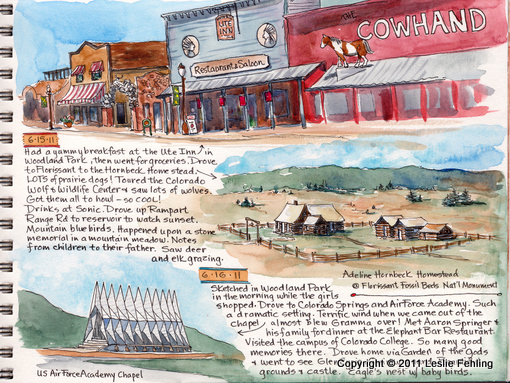 Visit again tomorrow - I'll be posting six more days of Colorado sketches! 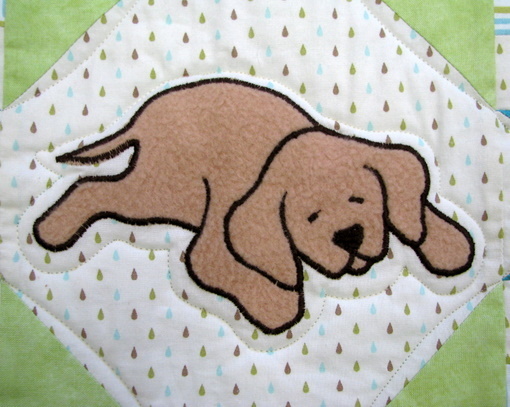 As soon as my daughter and son-in-law announced that they were expecting, I began planning a quilt for the new baby. 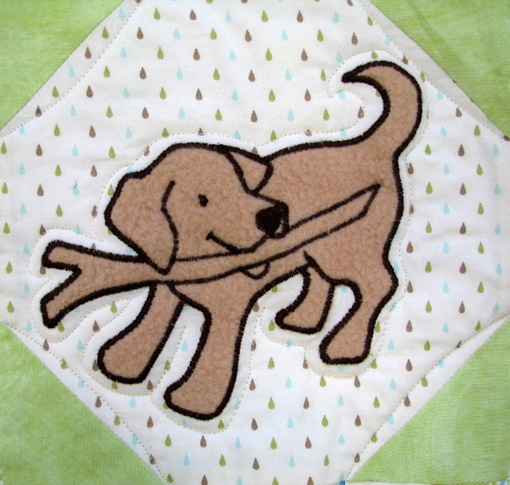 Since we're all dog crazy in this family, I decided to do a puppy quilt and start this baby off right! 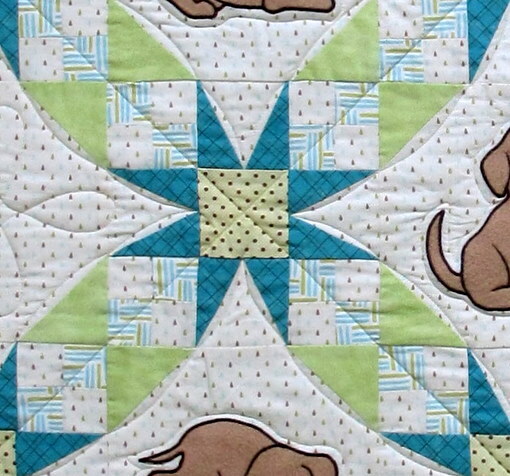 The celery green, aqua, and brown color scheme isn't tyical for a baby quilt, but I think the quilt has a nice, happy look to it, with playful puppies frolicking across the surface. The patchwork star blocks alternate with snowball blocks to make a nice secondary pattern. 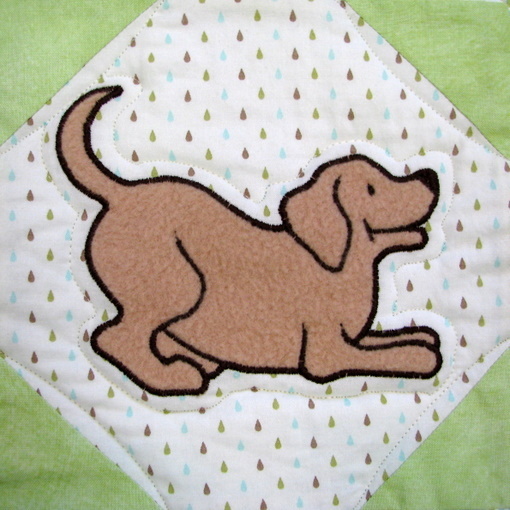 I drew the seven puppies and cut them from tan polar fleece backed with Heat'n Bond Lite fusible web, then ironed them onto the background. 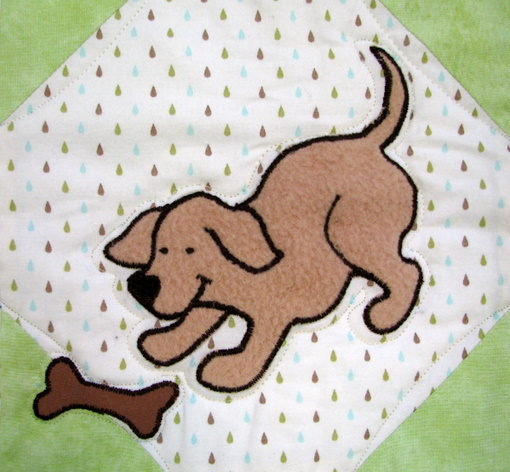 I used the polar fleece so busy little hands could feel the soft texture of the puppies' fur. 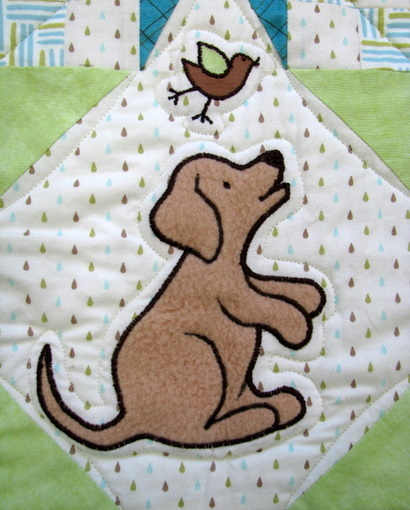 Each applique was then satin stitched with brown thread, making them durable and ready to withstand lots of washing and drying. 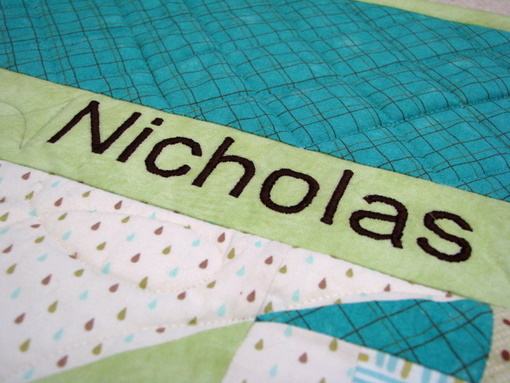 Satin stitching was also used to embroider my grandson's name and birthdate in the borders of the quilt. When you don't own an embroidery machine, you have to get creative! 2. Print it at the desired size. 3. 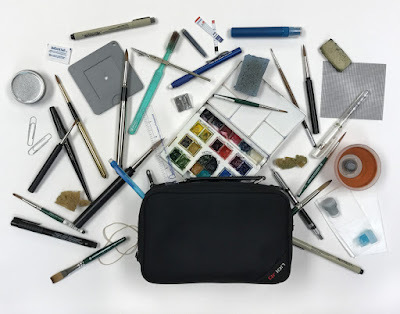 Trace the letters with an ultrafine Sharpie permanent pen onto Solvy water-soluble stabilizer. 4. Pin the Solvy in place on the quilt top. 5. Satin stitch the lettering, using the traced lines as a guide. 6. Tear away the Solvy or dissolve it in water. 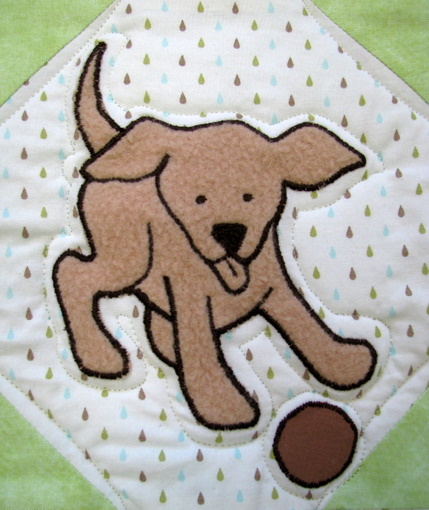 It's quicker than hand embroidery, but it takes a lot of attention to detail to get nice, neat results. 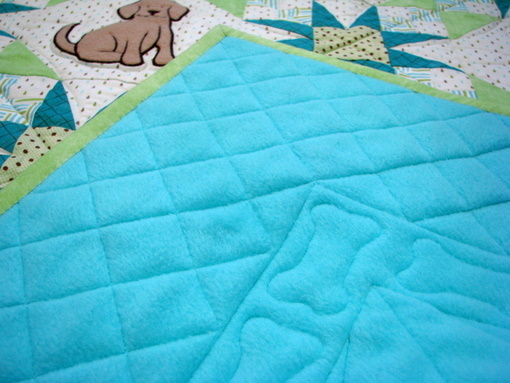 Soft turquoise polar fleece covers the back of the quilt, and a thin white polar fleece was used as a filler, making the quilt really soft, warm, and snuggly. 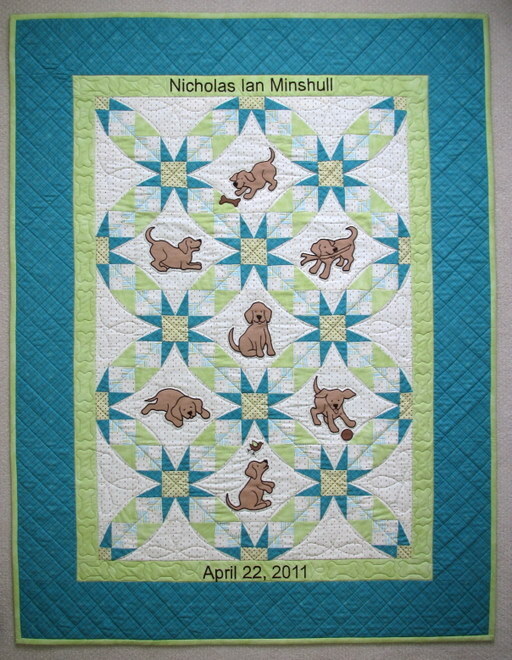 The quilt is entirely machine quilted and was primarily done free motion. 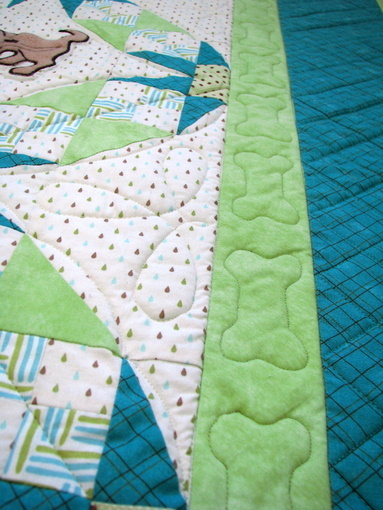 I quilted bones (doggie treats for the puppies) in the green border and a grid design in the turquoise border. 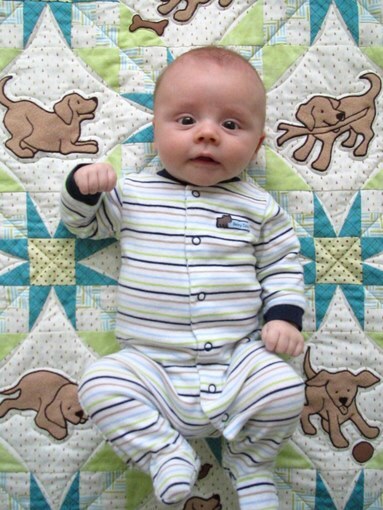 Nicholas loves his new quilt! And I love that sweet little baby!